Free shipping. Buy direct from HP. See customer reviews and comparisons for the HP Instant Ink Prepaid eCode ($5) - 50/100/300-page Plan. Upgrades and savings on select products. Your printer anticipates when you need ink and delivers it straight to your door. Ink, shipping, and cartridge recycling are included.Monthly plans are based on the number of pages printed, not cartridges used. Pick your plan during sign-up. Get Ink only when you need it. 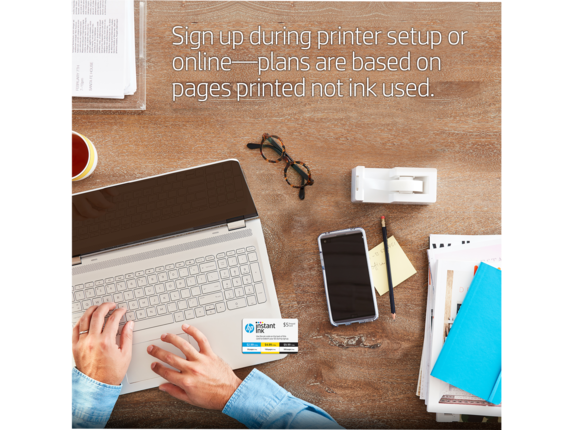 Apply prepaid card value during signup while setting up your printer or at hpinstantink.com.Ensure you have an eligible printer, Internet connection and credit or debit card. Your printer anticipates when you need ink and delivers it straight to your door.Ink, shipping, and cartridge recycling are included.Monthly plans are based on the number of pages printed, not cartridges used. Choose from 3 plans based on the number of pages you print in a month. Black-and-white or color, the cost is the same.Plans: 50 monthly pages for $2.99/mo; 100 monthly pages for $4.99/mo; 300 monthly pages for $9.99/moYou can rollover unused pages to the next month, or if needed buy additional sets of pages for just $1. By keeping your printer connected to the internet it tells us when to send more Original HP Ink before you run out, and only when you need it.Change your plan or cancel any time. No annual fee or commitment. 1 Save up to 50% on ink—based on monthly subscription cost using only all pages in plan vs. cost per page of most color inkjet cartridge printers < $399. Share of New Inkjet Unit Shipments (< $399) for 2018Q1 period in the US from IDC 2018Q1 Final Release. Standard cartridge CPP from gap intelligence 7/24/18. 2 Get ink when you need it—based on plan usage, Internet connection to eligible HP printer, valid credit/debit card, email address, and delivery service in your geographic area. 3 Change or cancel your plan at any time online. If you decide to cancel your HP Instant Ink plan you can go back to using HP original Standard or XL cartridges. Plan upgrades are effective immediately and the charges will be applied retrospectively or in the next billing cycle, depending on user choice. Plan downgrades and cancellations are effective after the last day of the current billing period. For full details go to instantink.hpconnected.com/terms. 4 Rollover allows unused pages in a month to be placed in a rollover account and then applied to pages in excess of your monthly allowance. The rollover account balance is limited to a maximum or your monthly service plan pages (e.g: $2.99 50 pages = 50 page rollover maximum). 5 Valid only in U.S.A. 1 Save up to 50% on ink—based on monthly subscription cost using only all pages in plan vs. cost per page of most color inkjet cartridge printers < $399. Share of New Inkjet Unit Shipments (< $399) for 2018Q1 period in the US from IDC 2018Q1 Final Release. Standard cartridge CPP from gap intelligence 7/24/18. 2 Get ink when you need it—based on plan usage, Internet connection to eligible HP printer, valid credit/debit card, email address, and delivery service in your geographic area.